We're taking the bike to the dealership to have it looked at by the insurance adjuster. My guess is they total her brand new bike.... Damage to the fairing, side plastic, foot peg, side stand, handlebars turn signal and both saddle bags. The steering head is about 5 degrees off center which tells me the neck is bent. She was on the expressway heading towards Ligoner. At the squirrel Hill tunnel,traffic in the right lane slowed, so she checked her mirrors and moved to the left lane. Evidently the driver behind her did the same at the same time and hit her from behind. In all, she is very lucky given the speed she was traveling and where it happened. Her comment to me before leaving for school this morning was she hopes they pay out quickly so she can get another bike before the end of the season. scorpion46, Whiskey and EL Pistoffo like this. Sorry to hear about her accident but sure glad to hear that she's well enough to want to get back on the saddle. Wow, sorry to hear this, but very glad she's ok.
Last edited by Skrapiron; 06-05-2018 at 04:31 PM. Her comment to me before leaving for school this morning was she hopes they pay out quickly so she can get another bike before the end of the season. Yup! She's definitely your daughter. Glad she's doing well. 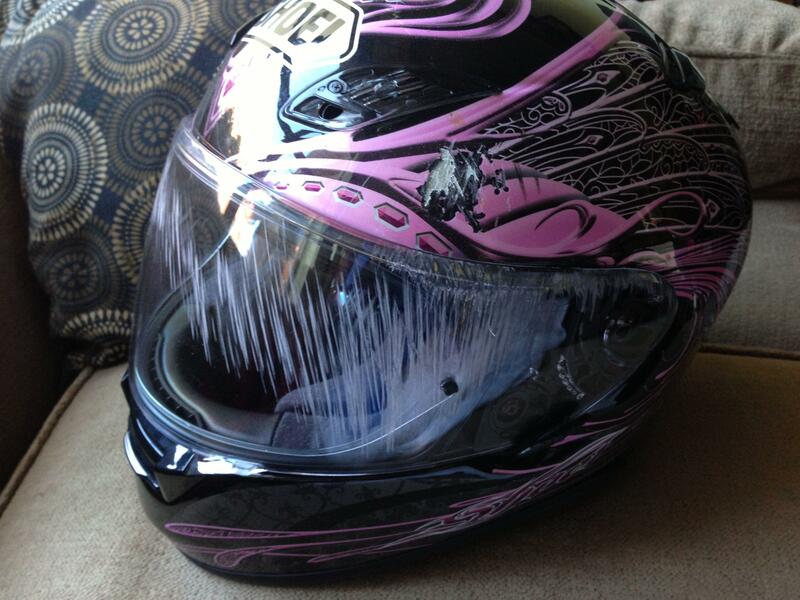 That helmet definitely saved her life. Very glad your daughter is alright! Know Hiway, lots of accidents at the tunnels. glad to read she's ok...give her a hug from everyone here. Glad to hear that she was OK and super glad to hear the she was wearing ATGATT. It make all the difference. OH man, I was going to ask if it was the new bike. Hate to see any bike go down, especially a new one. The car behind her must have hit the gas when changing lanes. Very glad to hear she's ok. I made myself and the wife follow a strict ATGATT policy. Even when it's scorching hot outside I don't slack with it, resulting in me riding less during the summer. The image on your previous post is missing.